A game changer. 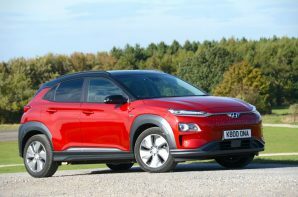 If you don’t like reading car reviews that is your 3 word summary of the KONA electric. However the fact that you have ended up here suggests that you might want us to elaborate. If you have read any of our reviews of KIA’s and Hyundai’s over the past few years you will already know that we have been hugely impressed with how the brand has transformed itself from a budget bit player to serious contender. The KONA electric captures the moment that catching up became leap frogging ahead. The bare stats are good but not hugely impressive, you get a choice of 39 kWh or 64 kWh battery which provides sensible performance along with a sensible price. However everything comes into focus when you see the range figures. With a 39 kWh battery the KONA covers 180 miles on the much harder WLTP test. This is a very good result. However the astonishing bit is that in the real world the Hyundai is capable of hitting this figure and that sets it apart from every other electric car on sale. It also means that the KONA delivers super low CO2 emissions. It is nothing short of a miracle that Hyundai has cracked the biggest issue facing electric cars, namely the difference between official and real world range. If that still isn’t enough for a few extra quid the 64 kWh battery will deliver an excellent 279 miles. This fact alone would make us very big fans of the KONA but the good news doesn’t stop there. The electric bits are wrapped in an attractive and very on trend crossover body, the interior is well laid out and works very well and like every other car in the range you get a 5 year unlimited warranty for the whole car and an 8 year 120,000 mile warranty for the battery. On the move it is good to drive and delivers a comfortable ride. You get to choose the level of regenerative braking you want from 0 to level 4 and there is an automatic setting too which adjusts depending on gradient, level of battery charge and distance from the vehicle in front. As with all electric cars the instant torque delivery makes the KONA feel quicker than the 0-62 mph figure suggests and refinement is excellent. The KONA is a game changer because it delivers its official range in the real world. However it also offers good looks, practicality, clever tech, CCS Combo charge compatibility with 100 kW capability and all at a very competitive price which for many likely buyers can genuinely be described as affordable. Well done Hyundai.